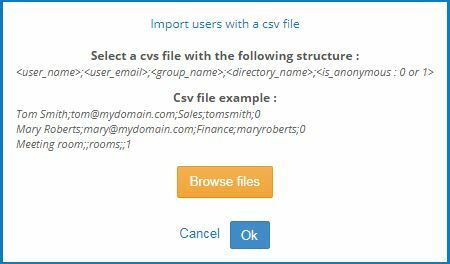 How to import users from a CSV file? group_name: user’s group (ex: sales, marketing, team B, etc). Later on, if you create a policy “Sales” for example, you’ll be able to apply it to the group_name Sales and all users in this group will be impacted. directory_name: user name in company directory, could be helpful to automatically configure email parameters for example. is_anonymous: to know what is an Anonymous user and how to use it, please read our Add “Anonymous” users help page. In this example, we’re putting “0” for “is_anonymous:0 or 1”. 2. Then from the Users tab click on the blue button Import your users. Select your CSV file and click on OK.
3. If the upload is successful, users will be created and appear in the Users tab. Here you can see the message “No device enrolled”, which is normal: as soon as a device will be enrolled and linked to a user, it will be displayed here. 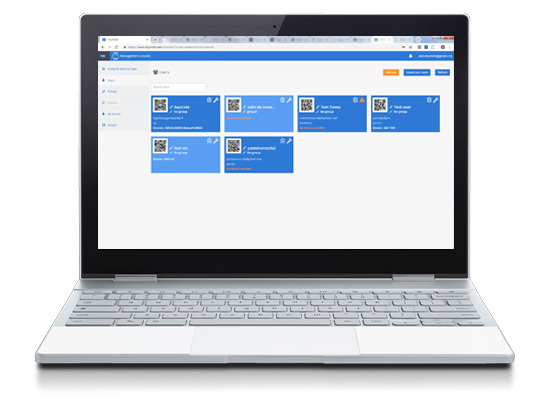 Once created, your users will then receive a QR code and a password via email that they will need to enroll their device later on (using either one). 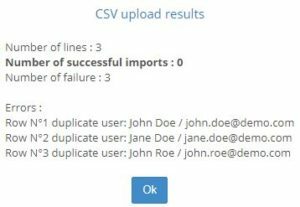 In the CSV upload results, if you see the error “Row N°X duplicate user: XXXX”, it’s because the user already exists in your console. Please delete this user from the file or from the console and try again.